For better digestion, even moods, and a stronger immune system, keeping beneficial bacteria balanced throughout your digestive system is a must. Include probiotic-rich foods like homemade sauerkraut in your diet as a source of a surprising number of health benefits. It may seem like you would need a list of special materials and weirdo ingredients in order to make your own sauerkraut, but it's actually quite easy. Homemade sauerkraut is so much tastier than the store-bought variety, and it also contains a lot more healthy bacteria. A head of cabbage, some salt, and a couple of canning jars are all you need to make up to two quarts of sauerkraut. Several simple steps and about $1.50 worth of cabbage (unless you stock up during the St. Patrick's Day sales, then it's even cheaper!) provides you with quite a few servings. An added benefit to making homemake sauerkraut is that you can make custom varieties. Dress it up by adding ingredients to your shredded cabbage, like carrots, beets, and fresh herbs to add flavor, texture, and color variety. Ball canning jars (or whatever brand you find) make excellent fermenting containers. You may also use a crock, although these bulky items tend to be a bit pricey and cumbersome. Canning jars are easy to find in any discount store. I bought a box containing a dozen generic brand jars for about eight bucks at my local Wal-Mart. Many grocery stores also have them in stock. The best style to use is the wide-mouth jar. It's much easier to get the veggies in them. Unfortunately, I have only the regular ones, but we make do. So if the regular ones are all you have, that's fine, too. The Amazon link is basically a reference; it seems many people have received their jars broken because the glass isn't packaged properly for shipment. Important! Before You Begin . . .
Use warm, soapy water to clean your jars well. Rinse them thoroughly with hot water. 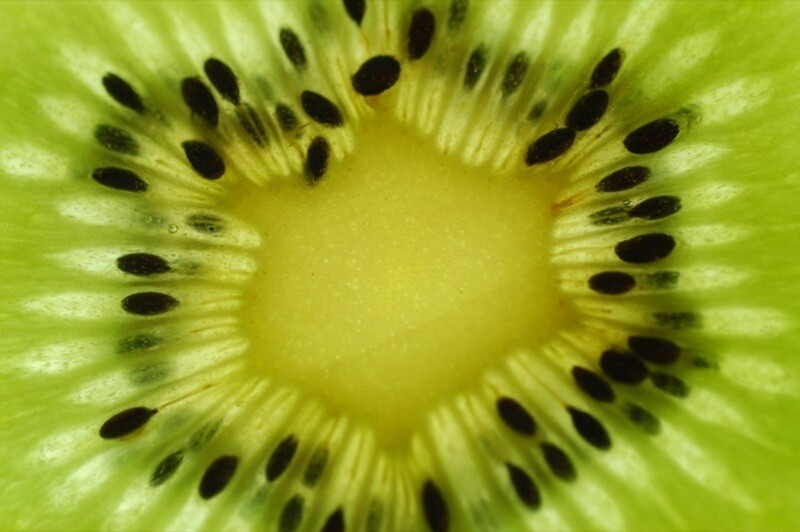 Cleanliness is important when it comes to fermenting foods. Some people prefer to boil their jars (not the lids). For me, a good cleaning with hot water is enough. Even a smallish-sized head of cabbage makes a significant amount of sauerkraut. The cabbage I used in these photos was the smallest one in the pile at the store, and it filled two quart-sized jars. Save a few of the outer leaves for later. They provide a nice covering to keep the little pieces of sauerkraut from floating above water. 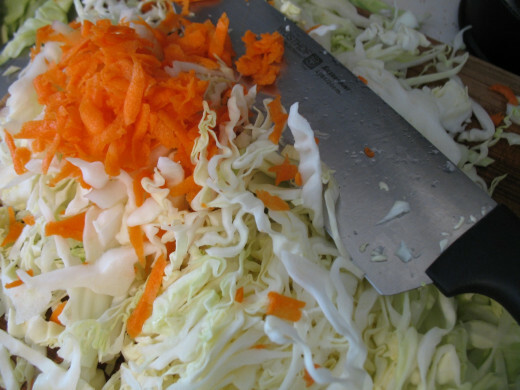 Use a sharp knife to shred your cabbage. How thin you slice it depends on personal preference. For my two jars of homemade sauerkraut here, I also added three carrots that I grated with a hand grater. Sometimes I include more shredded carrots, depending on how many I have on hand. Minced garlic is so delicious, you won't believe it. It adds a nice flavor and aroma to the batch. Everyone in the house will ask, "What are you cooking--it smells amazing!" Or something to that effect. You may also add grated beets, apples, or whatever sounds good to you. Using the cabbage as your base, create a sort of salad with a variety of vegetables or fruits that complement each other. Keep in mind the types of dishes that you will pair with the finished product. 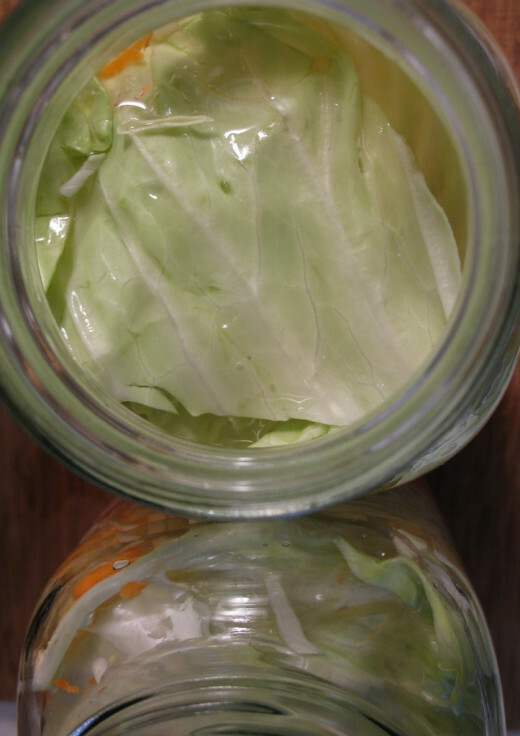 Make a variety of creations, adding different vegetables to your cabbage base in each jar. Toss your shredded cabbage (and other veggies if you're adding them) into a big bowl. Add salt to your cabbage mixture. I add a tablespoon of salt per jar. So if you have enough to fit into two jars, add two tablespoons. You don't need exact measurements here. Use your hands and fingers to mush it around and soften the veggies. Do this for a minute or two, or longer if you're in the mood. You'll notice that a little bit of moisture comes out of the ingredients. Put the salty cabbage into the jars. Push it in there with your fingers. Place the leaves on top as you see in the photo above. This will help to keep the little shredded pieces from floating above the water. I try to tuck the leaves around the edges like a sheet on a bed. Add enough filtered water to cover the vegetables. You can see how this is done in the photo below. You may also use the liquid that's left over from previous batches of sauerkraut. We'll talk about this more, later. As your homemade sauerkraut ferments on your counter top (or on top of your fridge), happy and healthy bacteria will grow and flourish. Little gas bubbles cause the vegetables to float above the water, which can lead to mold. Yuck! We don't want that. If you're using a crock, you can use a stone weight that is made for it. 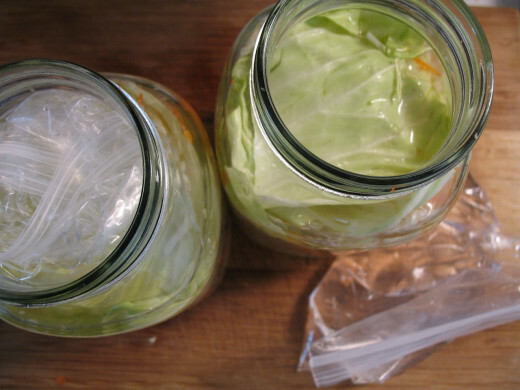 If you use canning jars, add a little bit of water to a zip-lock sandwich bag. Tuck it into the jar on top of your soon-to-be sauerkraut. This will keep it all below the water and prevent mold from developing. Place something underneath your jars to catch liquid in case the gas bubbles from fermentation cause a spillover. All you need is a plate, cake pan, whatever. I'm not crazy about using plastic bags because of the chemicals, but it's the easiest option. Also, they say that the probiotics feast on the toxins contained in the plastic. 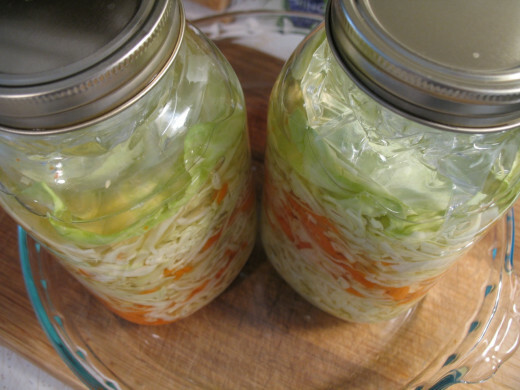 Keep your sauerkraut in a warm place and away from anything else you might be culturing. In other words, if you have kombucha or yogurt brewing on top of your fridge, move the sauerkraut to a counter top that is about five feet away or so. Those of us who are fermentation freaks have been known to use bedroom closet shelves in order to maintain distance from other projects. For the greatest concentration of good bacteria, let your sauerkraut sit for about three to four weeks. The longer the better. Just be sure to keep an eye on it and check for mold. This shouldn't be a problem, though. Room temperature--about 70 to 78 degrees--is ideal for making homemade sauerkraut. The warmer it is, the quicker your concoction with ferment. This is a good thing! There's no exact time to tell when your sauerkraut is done. In other words, you don't have to mark your calendar for the exact day that it will be done. 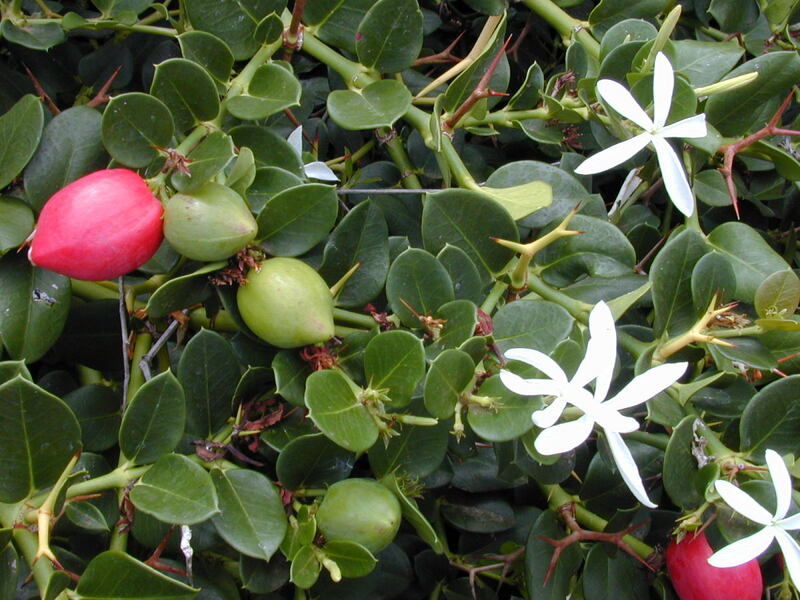 It will have a tangy taste after about a week or two, but three to four weeks is ideal in order to get the most health benefits out of it. Stick it in the fridge when you're ready. Actually, refrigeration isn't necessary. You can eat it warm, but most people like to keep it in the fridge to prevent mold and enjoy it cold. It will continue to culture, but at a much slower pace. Don't Toss the Liquid Gold! When you're done with your homemade sauerkraut, the leftover water is teeming with healthy bacteria. Don't pour it down the drain--save it for your next batch. 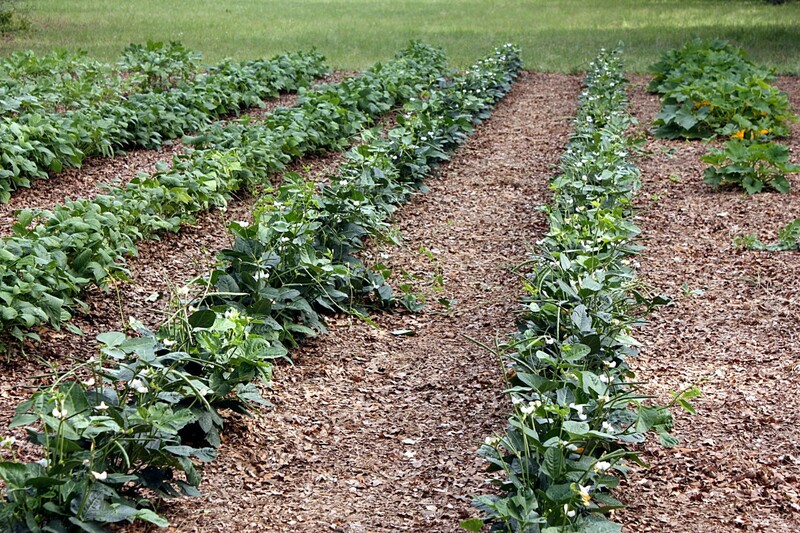 This way, you will have a head start when your vegetable start to culture. When you make your next batch of sauerkraut, just use the juice from your last batch in place of the filtered water. It doesn't matter if you still have some bits of sauerkraut or used different ingredients. Add more water to this new batch if you need to. You can use this liquid to add some flavor to cooked vegetables or salads. 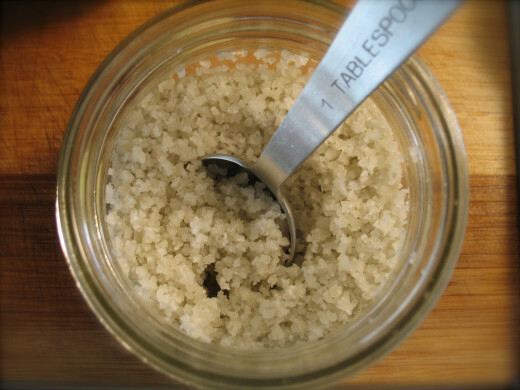 Some people use the sauerkraut liquid to add some tang to homemade salad dressings or marinades. Put sauerkrat in your eggs for a satisfying breakfast. Stir it in with a can of tuna for a quick lunch. Pile it on your grass-fed beef for a tasty dinner. 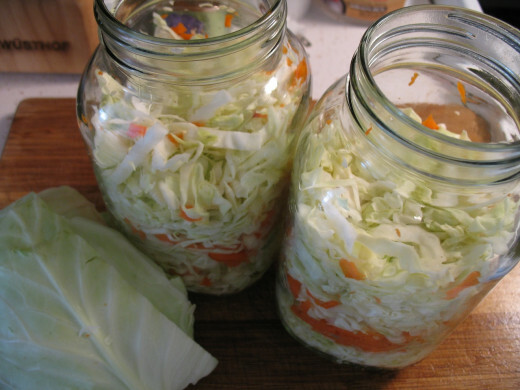 If you don't normally eat fermented foods, be sure to limit your consumption to about one-quarter cup per day at first. The probiotics will go right to work killing off pathogens in your gut, and too much at once can give you a bit of indigestion. It's easy to go overboard when you discover how delicious your fresh sauerkraut is! On the other hand, these probiotics break down the plant cellulose that causes gas and bloating, making it safe to eat before social events. Wash your canning jars well. Add to a bowl with salt. Add the mixture to jars. Add filtered water or saved liquid. Weigh it down with bagged water. Put the jars on a plate. Keep in a warm place away from other ferments. 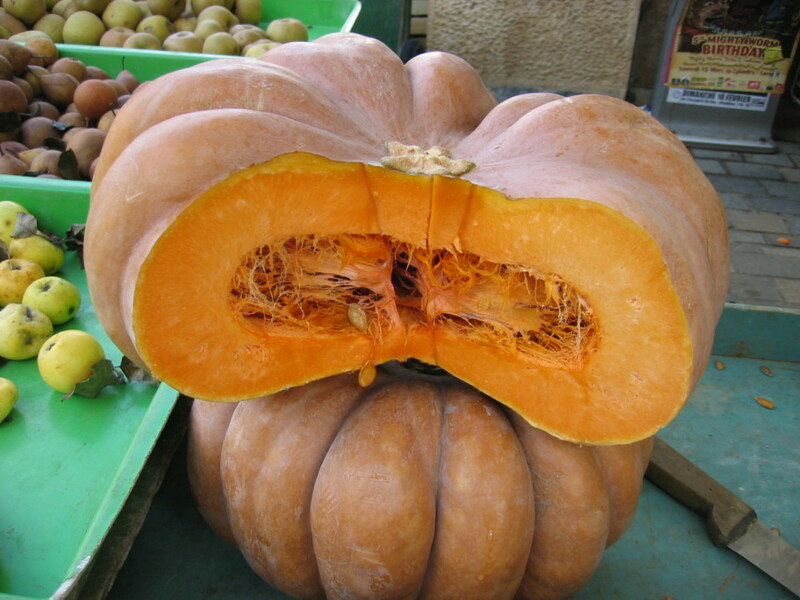 Let sit at room temp for three to four weeks. Save the leftover liquid for your next batch. 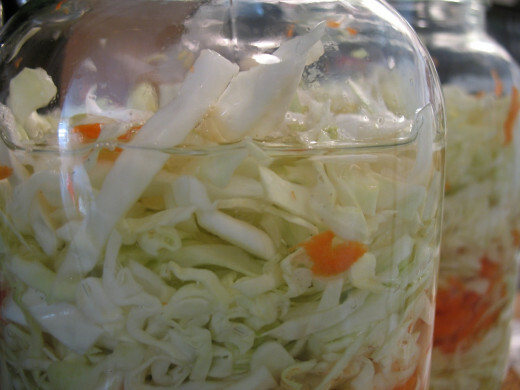 Are fermented vegetables a regular part of your diet? I am not one to ferment my own food. Still, this was a very interesting hub. Do you screw the cap on tightly? Does the pressure need to be released periodically? Thank you, Scarlettohairy! Hope you enjoy it. Audrey, you can try tap water if you want. I recommend filtered water because most tap water contains contaminants that can hinder the growth of beneficial bacteria. But if you have clean tap water, then go for it! Thank you! Wow, what great information. I think I'll grab some cabbage and give this a try! Thanks, btrbell! That's great that you've made getting your probiotics a habit. Most don't realize how important they are for your health. Definitely. I have my homemade sauerkraut almost every day--it's a great way to support digestive health and extremely important for those with gluten intolerance. Thanks for your comment! Sounds like a great healing strategy (especially for me, after what I've been through). I look forward to giving this a go. Another great idea, Radcliff! Can't wait to try this.